Dedicated to the innovative design and use of ceramic materials for energy applications, this issue brings readers up to date with some of the most important research discoveries and new and emerging applications in the field. Contributions come from the proceedings of three symposia, as well as the European Union–USA Engineering Ceramics Summit. The three symposia are: Ceramics for Electric Energy Generation, Storage, and Distribution; Advanced Ceramics and Composites for Nuclear and Fusion Applications; and Advanced Materials and Technologies for Rechargeable Batteries. An abundance of charts, tables, and illustrations are included throughout. 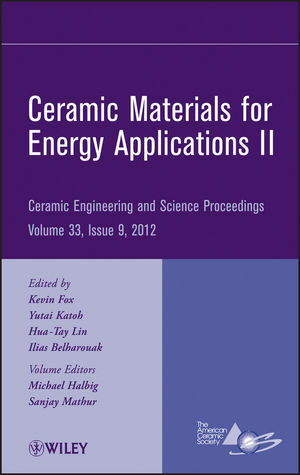 Kevin M. Fox is the author of Ceramic Materials for Energy Applications II, Volume 33, Issue 9, published by Wiley.